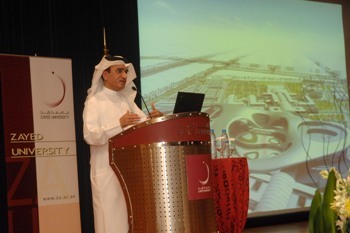 Dr. Al Jassim gives his speech. Preparations are currently underway at Zayed University to accept male students, for the first time on its Dubai Campus, next academic year. It has been decided to accept about 200 UAE students in the first stage, as per available educational and academic programs. A special building is now being prepared for this purpose. In emphasizing the importance of this step, Dr. Sulaiman Al Jassim, Vice President of Zayed University, said that this new initiative provides good opportunities for male students, for the first time in Dubai, especially after the success of this experiment on Abu Dhabi Campus, whereby 342 male students are studying in a separate building. He added that preparations, including technical and architectural plans, are now underway to get a special building ready to receive male students as scheduled. Their studying shift will be from 3:00 until 7:30 in the afternoons, while female students will continue studying regularly in their other buildings. Dr. Al Jassim added that the excellent courses and programs, offered by ZU, have contributed to receiving its international academic accreditation from "The Middle States Commission on Higher Education", thus it became the first university, not only in the Middle East but also outside the United States of America, to receive such accreditation. He added that the University is characterized by encouraging its students to deepen their understanding of the programs offered which train them to become more skillful and experienced in communication with other cultures of the people of the world, as reflected positively through improving students' academic and educational outcomes. Dr. Al Jsssim concluded by saying that the number of ZU students, both in Dubai and Abu Dhabi Campuses, is about five thousand. On the other hand, a number of students, who have chosen Zayed University to further their studies and specializations, have expressed their great appreciation to the University for its new gesture of accepting male students. In this regard, students Saud Salim Al Dhahiri; Khalifa Issa Rahma; Mohammed Khamees Al-Naimi; Hamid Khamees Al Saadi - of Al Ain Institute of Applied Technology - said that even though they live in Al Ain, they have decided to pick Zayed University as their top choice for undergraduate studies after having been informed about the academic programs and activities offered to serve the community. These programs also contribute to providing students with adequate skills to serve their community, besides gaining academic and social knowledge and education.